Bulgarian National Television: For the 13th consecutive year Tihomir Kamenov is the only Bulgarian attending the World Economic Forum in Davos « Commercial League National Pharma Center Inc. 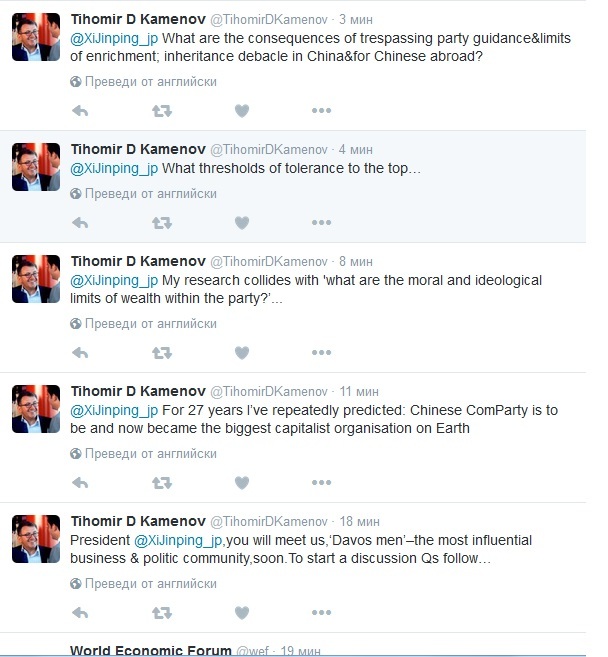 In Twitter Kamenov asked a number of questions to the President of China and Chairman of the Chinese Communist Party Xi Jinping. The questions are expected to provoke widespread interest at the forthcoming Forum. The businessman Tihomir Kamenov is the only Bulgarian who for the 13th consecutive year has been invited to participate in the World Economic Forum in Davos, Switzerland. His very first invitation to join the Forum was given in 2004 in Warsaw, on the occasion of the accession of the first ten Eastern and Central European countries to the EU. Tihomir Kamenov told the media that he has already prepared questions to the President of China and Chairman of the Chinese Communist Party Xi Jinping. According to him, the questions are expected to provoke widespread interest at the forthcoming Forum, where the Chinese leader is also expected to take part (original questions see above). The World Economic Forum is an international nongovernmental organization founded by the professor of economy Klaus Schwab in 1971. Each year during the event take place gatherings of the world’s most prominent business and political leaders, intellectuals and journalists to discuss current global affairs and seek solutions together. This year the World Economic Forum will convene from 15th to 20th January.